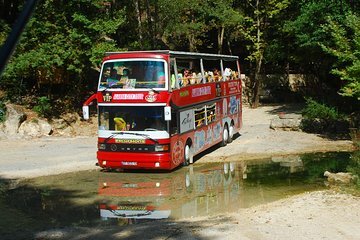 Súbete a un tour guiado en autobús de dos pisos por Alanya y conoce los lugares más populares de la ciudad en este tour de día completo, una excelente manera para que los visitantes primerizos puedan orientarse. Visitará la cueva Damlatas, la Torre Roja y el castillo Alanya en la cima de la colina, pasear por el animado puerto y darse un baño en la playa de Cleopatra, antes de salir de la ciudad para disfrutar de un almuerzo junto al río Dim Cay. We had a tour bus that had probably 75 Russian-speaking passengers, 15 German-speaking passengers, and 10 English-speaking passengers. There was one guide who split her time between English and German. The Russian guide simply seemed like she gave a lot more detail to the tourists than the English/German guide did. Our guide didn't actually give us very much useful information at all. She mostly talked about the prices of various specific houses this house here is owned by some Scandanavian guy and is worth 150,000, which I'm not sure why I should care about. Many of the sights on this tour I also saw on another tour Alanya 3 Hour City Tour with Sunset Panaroma by Jeep, and the guides there gave much more in-depth information in less time. There was one point where the guide took us to a garden and literally said something along the lines of here's the garden you can go take pictures if you like. There are plants in every country can you tell me why I'm supposed to care about these specific plants? Meanwhile the Russian tour guide seemed to be explaining something to her group for about 10 minutes. I don't speak Russian, but I would at least like to know what the point of the attraction is. The only redeeming part of this tour is just that it is indeed a sightseeing tour of the highlights of Alanya. They'll tell you what to take pictures of, you'll just have to find out information about it some other way.